Do you know the dangerous difference between an ant and a termite? Most people are comfortable that they know what an ant is, but hardly anyone seems sure they know what makes a termite a termite. Termites are not ants and certainly not white ants. Swarming insects in the Spring may or may not be termites. 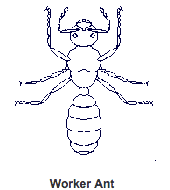 Winged ants are often confused with winged termites. Ants have bent antennae, termites have straight. Ants have thin waists, termites have thick. 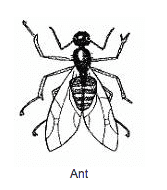 Ants have front wings that are longer than their back, termite have both pairs the same size. If you see winged, ant-like insects flying around your property, you need to know whether they are ants or subterranean termites. Carefully compare the insects flying around your house to the illustrations below. If you're uncertain, call us for positive identification. If the insects are termites, CALL US IMMEDIATELY!